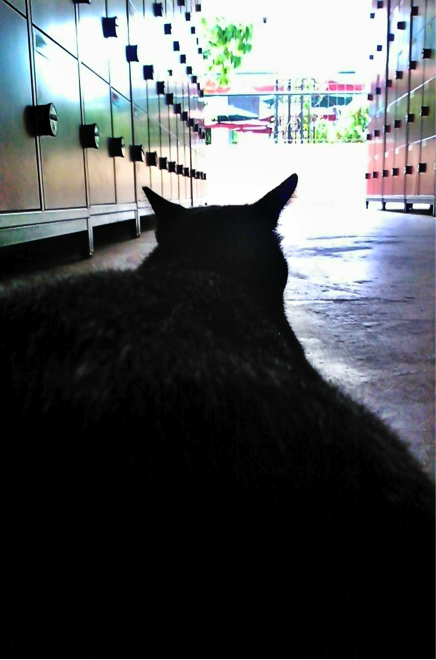 Sometimes prowling the Level One locker area, at other times melting the hearts of students ‘mugging’ in the canteen (and thereby taking their food), the RJ Cats have become an iconic part of every RI student’s life. These furry little critters’ prolificacy and tendency to wander make them almost impossible to miss on a typical day in school. Raffles Press approached a group of our resident cat-enthusiasts, including a self-titled ‘Cat Daddy’, to find out more. If you, in the midst of opening your locker in the Level One locker area, feel a whisper of fur rubbing against your bare leg, there is no need for alarm. It’s probably just Snuffles or Gingy. Never heard of those names? Well, now’s just the time to find out just who those enigmatic characters are! It all began with the original RJ Cat, Jiggles. She’s easily identified by her tail, which looks a tad deformed. While there are many theories and rumours regarding her tail’s tale, nobody knows for sure what happened to it. What we do know for sure, is that she’s a really old cat. According to the friendly uncle running the Western stall, Jiggles has been around for about 10 years. Jiggles is also one of the more friendly cats, as she is very accustomed to human company which kind of explains her relatively bulkier frame; more human interaction means more food. Jiggles is also rather lazy, with her favourite napping spots being the top of canteen tables and beneath canteen benches. Then there’s the handsome one, Snuffles. 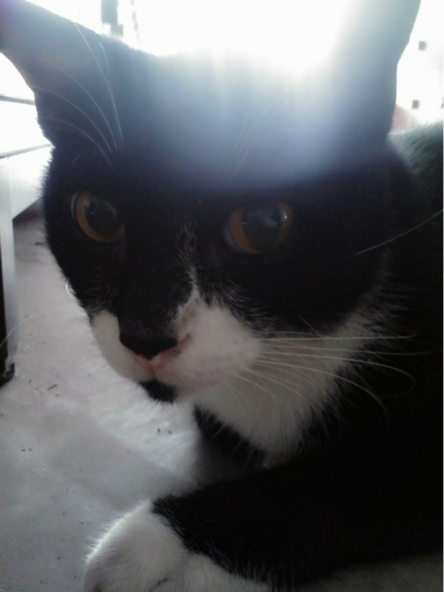 This cat has a sleek, black coat which resembles a tuxedo. He had a bad ear infection about a year ago, only managing to recover completely with a little help from the school’s informal Cat Club. But that’s a story for later on. Meet Teddy, the gray cat with tiger stripes and distinctive yellow eyes. 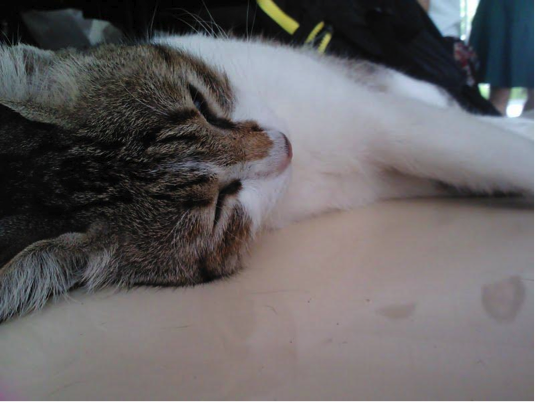 Teddy’s generally a very sleepy cat, and can be spotted napping all over the school canteen and locker area from the tables all the way down to the floor. When we stumbled across Teddy, she was sleeping beneath one of the canteen benches. A light tickle behind her ears woke her up, and she stared just long enough for us to take a photo of her half-asleep state. According to one of the cat-enthusiasts, right after Teddy wakes up is high time to stroke or pat her, as this is the time she’s most receptive to touch. Finally, there’s the beautiful ginger one. This ginger ball of fur and fun is aptly named Gingy. He’s the son of Teddy, born a mere two years ago. He’s also the most active and receptive out of the four cats. 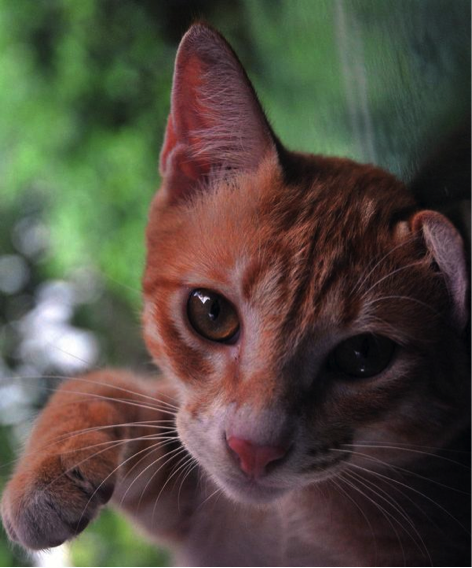 Apparently, cat-lovers in RJ particularly love playing with Gingy due to his playful nature and activeness. According to Bradley, Gingy loves chasing after students’ dongles and swatting at them. However, Gingy has a little flaw; he’s a tad too liberal with the use of his claws. Although his mother, Teddy and adopted ‘father’ Snuffles are fairly docile, Gingy has no qualms about using his claws. Bradley advised us not to try anything silly with Gingy; although he might not mean to hurt you, he might scratch you unwittingly. Gingy was also the most receptive to photographs; while the other cats lost interest in our camera quickly, Gingy appeared to be curious about it and often stared directly into the lens, allowing us to easily take photos of him. Gingy’s no longer with us today, though – a kind student has put him up for adoption. We sure hope he has found a warm, loving family! Apart from the RJ cats, there are also three more tortoiseshell cats, two kittens and one cat, over at the RI Y1-4 side. We don’t see them over here much, though. Enthusiasts can head over sometime to try to spot them! So it’s not entirely hugs and kisses all around for cats. However, it must be said that the percentage of the student population that dislikes the cats is small; many are simply indifferent. As Neo Weibin from 14S07A explains, “I don’t think the cats are a nuisance, and I don’t mind if they come over, but I won’t seek them out if I see them around, either.” It’s a very matter-of-fact, practical mindset that is prevalent in RI, where the cats are simply accepted as a part of the school community, neither venerated (unduly, anyway) nor spurned. Perhaps this peaceful coexistence is for the best, but there are those who are true cat lovers that encourage more interaction. Bradley Yam from 14A01C says, “If you like cats, the cats in RI are extremely friendly and they’ll more than enjoy it if you just take some time to pet them, and show them love and affection. The more time you spend with them – or, technically the more food you give them – the better you’ll be able to develop your relationship with them. After awhile, they start to recognize you and become rather attached.” If cats love human affection, RI students sure enjoy showering them with it: pop by the canteen or the lockers and invariably there will be at least one person cooing over a cat while his/her friend snaps photos to upload to Instagram later. There is a group of students who are devoted to the cats, though: be it simply spending afternoons with them or providing them with proper cat food, they know these creatures, their quirks and their histories intimately. Informally known simply as the Cat Club, it was formed by a group of like-minded friends who shared a similar passion; cats! They keep a relatively low profile, and some declined to be specifically named. However, their love for the RJ cats is undeniable. For instance, they managed to raise $400 for Snuffles (the tuxedo-wearing feline) when he had a serious ear infection. “We actually came up short because the vet’s fee was $700, but the doctor decided to waive the rest of it because we were students, and that was very nice of him,” said one of them. 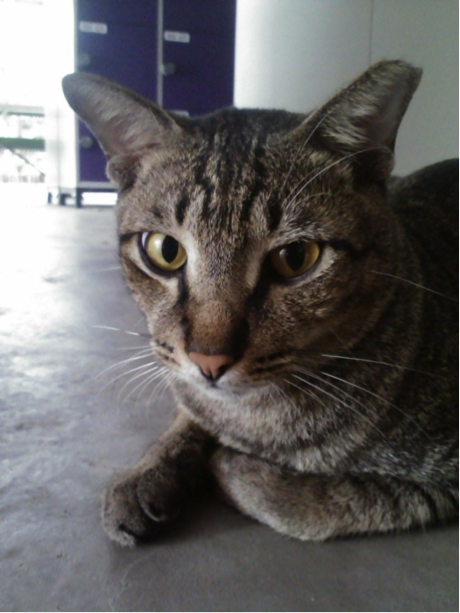 It just goes to show how a love for animals can transcend the confines of the school – RJ’s Cat Club doesn’t just treat the cats as adorable distractions; for them, these cats are definitely worth the extra time and care lavished upon them. Love them or hate them, these cats are here to stay; in our hearts, on our minds, around our food. You’ve missed out the all black one and the spotted brown one!! WHO GAVE YOU THE RIGHTS TO NAME THOSE CATS??? 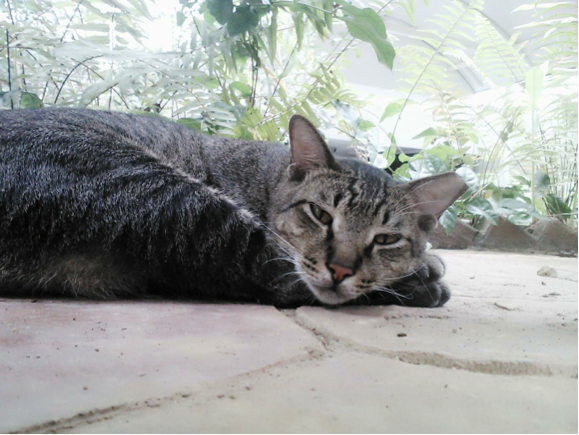 Enjoy reading about the cats and applaud Raffles students for being so kind and accomodating of these beautiful creatures, whether or not you love them.